Washingtonian Woods Homeowners Association, Inc. The Board of Directors is pleased to announce that for the remainder of the 2018 pool season the pool will remain open until 9pm on Friday and Saturday evenings! This modified schedule will start tomorrow, Friday July 6th. If this modified schedule is well received, the Board will consider making it a permanent addition for future seasons. Thank you to all that came out and enjoyed the 2nd Annual Washingtonian Woods 4th of July festivities! A huge shout out to Marcie Blackman, Rhonda Haley, Kelley Bennett, Tina Winters, Jen Simon, Kim Mlynarski, the Social Committee, and everyone else who volunteered to make the day such a wonderful success. For all those you attended, and for all those who missed, neighborhood resident, Tung Tu, has put together an awesome video of the day. Please feel free to click here and check it out! Just a reminder that this week’s recycling pickup has been rescheduled to this Saturday, July 7th due to the 4th of July holiday. Additionally, July’s monthly bulk pickup has been rescheduled to Wednesday, July 11, 2018. This entry was posted in News on July 6, 2018 by admin. Just a friendly reminder that the our neighborhood 4th of July Parade, BBQ and Pool Party, is tomorrow! The festivities start at 11am and continue until 4pm. Please click here for our full Schedule of Events. We are asking that families bring a side dish to share at the BBQ. The HOA will be providing burgers, dogs, sodas and desserts. A few volunteers are still needed. Please check out our sign-up genius and consider filling an empty slot. All help is greatly appreciated and will help ensure a successful event. This year’s parade route will start again at the Tot Lot near Upshire Circle and Driscoll Way, however this year the parade will mostly run along Midsummer Drive. If you happen to live along the 300, 400, and 500 blocks of Midsummer Drive, we kindly ask that you avoid on-street parking during the parade window of 11am – 12 noon, if possible. Please see below for this year’s parade route. The collection of recycled materials for residents whose regular recycling day is Wednesday, July 4, 2018, will take place on the following Saturday, July 7. This includes newspaper, mixed paper, corrugated cardboard, and commingled materials, as well as brush, branches, grass clippings, leaves and other yard trimmings, picked up by the City’s recycling contractor. Bulk pick up items will be collected the following Wednesday, July 11, 2018, for those whose bulk pick up day falls on July 4. This entry was posted in News on July 3, 2018 by admin. Just a friendly reminder that the our neighborhood 4th of July Parade, BBQ and Pool Party, will be held on Wednesday, July 4th! Gaithersburg SummerFest and Fireworks Tonight! Join family and friends for SummerFest on SATURDAY, JUNE 30 from 5 to 11:30 p.m. at Bohrer Park at Summit Hall Farm. Admission is free. SummerFest kicks off at 5 p.m. with The After Party Experience, a dynamic and energetic band featuring some of the region’s most talented singers and musicians paired up with an on-stage DJ. Enjoy rock, pop, country, soul, R&B, hip hop, jazz, Motown, and current hits right up until the fireworks begin. Stay for an encore performance during the SummerGlo After Party. Enjoy strolling entertainers, inflatable amusements, a dual-lane zip line, kid’s activities, face painting, aerialists, balloon twisting, volleyball, field games, community talent groups, chalk art, and a photo booth. Most activities are free. It’s predicted to be a hot one on Saturday. The Activity Center will be open as a cooling center, with indoor activities, crafts, and a DJ. Once the sun sets (approximately 9:30 p.m.), a spectacular fireworks display with light up the night with bursts that launch up to 500 feet in amazing colors and styles. Optimal viewing areas are at Bohrer Park and at several points in surrounding locations. A map identifying best viewing spots is available here. Stay late and avoid the traffic! Following the fireworks, The After Party Experience will treat the crowd to an encore performance while LED hoopers, jugglers, stilt walkers and glow balloons entertain the crowd until 11:30 p.m. The playground will be fully lit, and there will be glow-in-the dark items and food for purchase. This entry was posted in News on June 30, 2018 by admin. This is a friendly reminder to all interested neighbors that the Washingtonian Woods Social Committee will be hosting a discussion/presentation with Officer Dan Lane of the Gaithersburg Police Department this evening on Civilian Response to an Active Shooter Event (CRASE). Have you been concerned by the school shootings lately? Do you worry about what you would do if you were faced with a situation where a gunman was in your office/shopping center/sporting event? We will be discussing: what are your options, what can you expect and what will the response be. Please join your neighbors at this social committee sponsored event. Spread the word. Tell a neighbor to join you! This entry was posted in News on June 24, 2018 by admin. Neighborhood 4th of July Parade, BBQ and Pool Party | Prizes! Food! Games! Contests! The 2nd Annual Washingtonian Woods 4th of July Parade, BBQ and Pool Party will be held on Wednesday, July 4th. Time to don your proudest red, white & blue, and decorate those bicycles, strollers, big wheels, scooters, wagons and pets! We’ll be marching as a group from the Tot Lot at Driscoll and Upshire all the way down to the pool. Feel free to decorate your bikes and scooters beforehand, or meet at the park at 11:00am to decorate onsite (we will have some decorations on hand.) The parade starts promptly at 11:30am. If you can’t march in the parade, feel free to come out and grab a spot along the parade route to enjoy the parade and show your support. All neighbors are also encouraged to fly your American flags! We’ll be grilling up plenty of hamburgers and hot dogs for all to enjoy, free of charge. We’ll also be providing sodas, water, and desserts. We are encouraging neighbors to bring side dishes for all to share. Games will include relay races, pie-eating contests, water balloon toss, belly-flop contests, and more! Prizes for the winners! Come on out and join the fun! Please note: the pool party and BBQ is a private event, exclusively for members of the neighborhood, their families, as well as outside members of the pool. Unfortunately, we can’t pull this endeavor off with a tremendous level of effort from the community. We are actively seeking neighbors to help volunteer to make this event a success. We need parade marshalls, grillmasters, game & contest volunteers, and people to help assist with food setup and take down. Please take a moment to visit our sign-up genius and sign up for an available slot. It’s a great way to socialize with and meet your neighbors. Come help us make this an event that everyone will enjoy, remember, and look forward to each year. Happy Birthday, America! Hope to see you all there! This entry was posted in News on June 23, 2018 by admin. Several of you may notice that the clubhouse parking lot will be getting repaired and resurfaced over the next several days. Especially, those that frequent the pool. While the summer season timing may not be ideal, the repairs are necessary and will be completed in a timely manner. The Board has taken steps to ensure that the repairs be completed with the least disruption as possible — the repairs should not affect Saturday’s swim meet, Saturday’s pool party, or any Clubhouse rentals next week. Light repair work will start on Friday, June 15th as several spots and pot holes are filled in. On Monday and Tuesday of next week, June 18th and 19th, the lot will be getting resealed and new line stripes. During those two days, no cars will be allowed in the parking lot, and all residents are encouraged to walk or bike to the pool; or, if driving, to park along Midsummer Drive. “Summer Kick-Off” Pool & Raft Party This Saturday! | 4th of July Parade | Food Truck Fridays! Just a friendly reminder that The Annual Washingtonian Woods “Summer Kick-Off” Pool & Raft Party will be held this Saturday, June 16th, from 4pm until 9pm. All neighbors and pool members are welcome and encouraged to attend! Music and treats for the kids will be provided. Taqueria & Pupuseria El Paso Food Truck will be at clubhouse from 5:00pm – 7:30pm for families to purchase dinner. – Bring your own rafts! – Glass containers are prohibited on the pool deck. – The pool will remain open until 9:00 pm. Please help us spread the word, and we hope to see you all there! Officer Dan Lane from the Gaithersburg Police Department will be at the clubhouse on Sunday June 24 at 7pm for a presentation of the Civilian Response to an Active Shooter Event. We will be discussing what are your options, what can you expect and what will the response be, should such a situation arise. Please join your neighbors at this social committee sponsored event. Adults only please. Wednesday, July 4th. 11am – 4pm. Mark your calendars for the 2nd Annual Washingtonian Woods 4th of July Parade, BBQ and Pool Party! *Free Food! and much more. Trucks typically serve from 5:30-7:30pm, pending weather. This entry was posted in News on June 12, 2018 by admin. Adults!! Join us for the 2nd Annual Derby Party (this year, Cinco de Derby!) at the upper clubhouse from 6pm – 10:30 pm. Tacos & fixings will be supplied from Sin & Grin Kentlands, please plan to bring a side/app or dessert to share. Also, if you are up for some friendly wagers on the Derby & other games, plan to bring $1s. BYO libations. And don’t forget your derby/cinco attire! See you Saturday! This week’s movie is: “Star Wars: Episode IV: A New Hope”. Movie starts at 7pm. More about Neighborhood Movie Night: On several weekend evenings in the Fall and Spring (when the weather is cool, yet comfortable) we plan to show outdoor movies on Candy Hill (341 Upshire Circle.) Neighbors are encouraged to bring jackets, blankets, pillows, snacks, bug spray, and any other items you wish to enjoy the show! Candy Hill has a natural grade and should allow good amphitheater-style viewing! We have many new families in the neighborhood, please reach out to your new neighbors and invite them to join the fun. Hope to see you there! This is not a fundraiser, but an opportunity to meet two candidates for County office who are friends of a more Sensible CCT — one that does not block entrances to our neighborhood and does not impact the homes on Upshire Circle. The event is very informal. RSVP is preferred, but people can just stop by on their way to and from the day’s other activities. You can learn more about this event here. If you haven’t already done so, please take a moment to complete your 2018 Pool Pass application and return to Tim Mulford at PMP no later than Friday, May 11th to ensure that you and your family will be able to access the pool on Opening Day. All homeowners please be advised that our April 2018 Board meeting has been rescheduled. The meeting has been rescheduled from Tuesday, 4/24 to Tuesday, 5/1 at 7pm. The meeting will still take place in the upper level of the Clubhouse. This entry was posted in News on April 24, 2018 by admin. 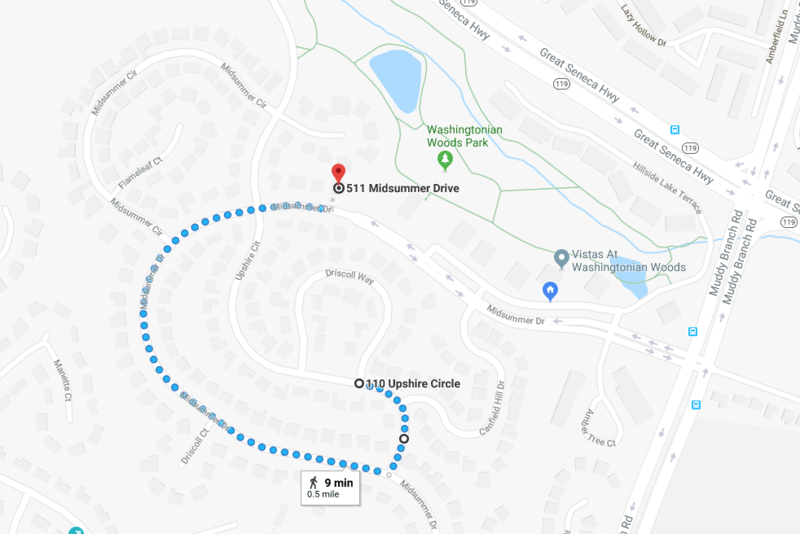 The City of Gaithersburg Department of Public Works will conduct street reconstruction on Midsummer Drive. The work will consist of removal and replacement of deteriorated curb and sidewalk, and the resurfacing of existing pavement. The curb and sidewalk replacement is anticipated to begin the week of April 23, weather permitting, and will continue for approximately four weeks. The resurfacing portion of the project will follow. “No Parking” signs will be posted at least 48 hours in advance of construction activity. These signs will be marked with the dates and times of the parking restrictions. If you plan to be away from your home for any length of time during this period, please make arrangements to have your vehicles parked off the street. All homeowners are reminded that as per Section 7.02 (e) of the Declaration of Covenants, all trash and garbage containers are to remain out of public view on all days other than scheduled collection days. All neighbors are encouraged to be mindful and supportive. This entry was posted in News on April 12, 2018 by admin.